From A Left Wing: Zidane, Corporate Robot? 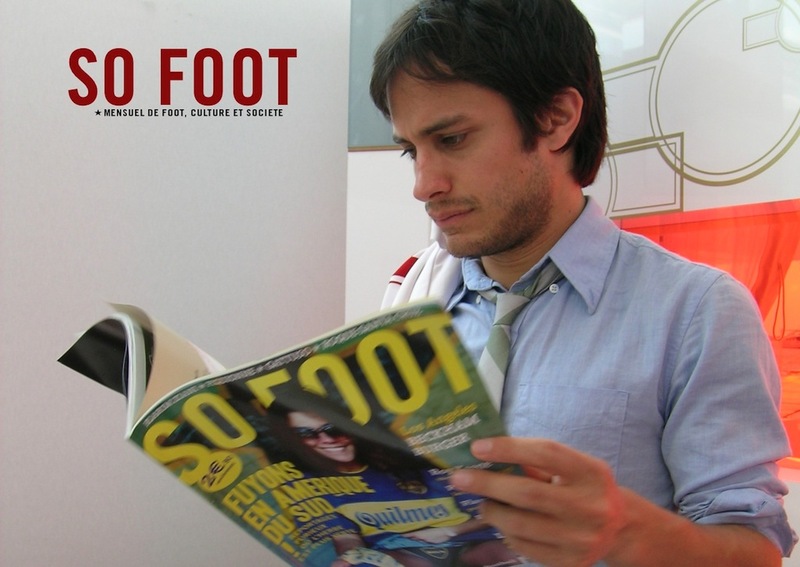 : From this month's "So Foot"
Very interesting... And Zizou gave his shirt to Sarko just a few months before he gave The People's Headbutt to panto villain Materazzi. Crazy. Dafri's comments are weird. At first, it seems like he's saying it's good to be ruthlessly ambitious and stop dwelling on your roots. Typical bootstraps stuff, as you say -- the idea that poor people are held back by a culture of poverty, and they could get out if they changed their mindset and bought cheaper sneakers. But then mid-rant, he changes his tune and he's denouncing Zidane for forgetting his roots. Hard to know exactly where he stands. But it's a very interesting interview. Thanks for translating it! laurie linked up! hooray. I'm a huge fan of hers. i had seen an interview with thuram from a while back in which it was remarked that zidane doesn't talk politics, doesn't present himself as a political figure. his comments on that point were really smart and interesting. 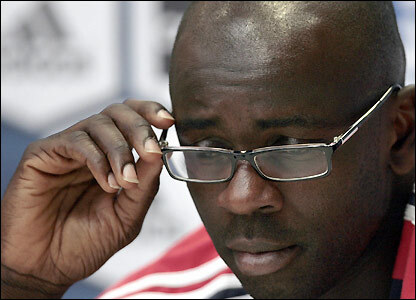 i've linked to a french video on this entry in which thuram addresses the interviewer - who asks him how come he's said that he himself is no politician - to which thuram answered well, what makes you think that's what i am - and she's like 'well, you are well informed, and you take a stand on the things you care about' and he's like, 'yes - but shouldn't we all be doing that?' pretty fierce. anyway, i am not sure i got the tone of this interview right, as dylan observes, as i translate dafri, he sounds kindof like a cranky grandpa at spots, and then way progressive in others. so - maybe he's a way progresive cranky grandpa? the subtitle of the so foot interview advertises him as kindof a former welfare-recipient turned success story - "ancien Rmist" which is I think someone who used to be on the dole as they say in londontown. anyway, i love french sports journalism. it's a mosh pit! First of all thanks for your translation Jennifer. There's a lot of scraps in what we call "football" on this side of the Atlantic. Abdel Raouf Dafri is right speaking of all these issues. When footballers open their mouths to say something clever like Thuram and Karambeu - that reminded their origins (slavery, colonization, etc) - the politicians and journalists opportunely fall on them criticizing their anti-national behaviour. Yes, we know these footballers have millions of euro on their bank accounts but it's a real masquerade panned by the media and political system to avoid to speak of the real issues in the French society (mainland, Guyana, Caribbean, La Réunion, Polynesia, Corsica...). I'm fed up, disgusted, I want to puke on these hidden rascists that are sucking France's money (like does Bush's Administration) from tens of million of people which are trying to make a living with $1,000-1,200 a month. Okay, let's say "Heil Frankreich!". Ribéry has an improbable career from bankrupted Olympique Alès to FC Bayern Munich. But never shown publicly any political involvement. He's young and one of the best French players. Shall wait before he starts to speak out of what is the life of a bankrupted jobless person in a collapsing France. By the way Abdel Raouf Dafri seems to be a good scriptwriter. Mesrine : L'Ennemi public n°1 (Mesrine: Public Enemy No. 1) is a must to see.